Wine collecting… when does it start? I don�t believe in assigning numeric scores to rate wines. Numeric scoring is about precision and rating wines is anything but precise. The editorial staff at the Wine Spectator has perfected the art of applying exact numeric scores to the wines they taste and in so doing, have created a culture of wine aficionados obsessed with numbers. Many wine drinkers won�t even consider buying a wine unless it �rated at least 90 in the Spectator.� Robert Parker is also famous for his wine scores and his publication, the Wine Advocate has made and broken the fortunes of many a vintner based on these scores. Kudos to the wine aficionado who can glean the difference between an 89 point wine and one rated 91 points. After twenty years of tasting, I still find this distinction fleeting. Furthermore, a wine enthusiast who buys purely on ratings will inevitably miss out on some real gems. The following is a set of guidelines for how to award points within each category. The visual appearance of a wine is an important factor in influencing a wine taster. Modern winemaking techniques almost guarantee that all wine made today is bright, clear and attractive to look at. Like the appearance of a wine, color plays an important role in influencing wine taster opinions. Wine color should always be appropriate for the varietal and age of the wine being assessed. Most wines exhibit highly-complex odors. The odors found in wines are really made up of two components: aroma and bouquet. Aroma is the set of odors that are related to the grape varietal(s) used to make the wine. Bouquet is the set of odors that are a result of the wine making process. The term �bottle bouquet� applies specifically to those odors caused as a result of the bottle aging process. Wines are considered balanced when total acidity, body and alcohol are in the proper proportion to one another. Wines lacking acidity often taste �flabby,� while wines with too much acidity often taste sharp, or unripe. Sweetness is an attribute that can enhance or detract from a wine. For each wine type/style, there are appropriate levels of sweetness that should be present. Body is the term used to describe mouth feel and weight. 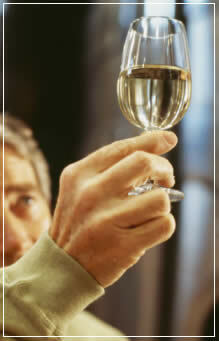 Full-bodied wines taste heavier in the mouth than do light-bodied wines, often having a �chewy� sensation on the palate. Wines exhibit a wide range of tastes and flavors that often become more complex as wine ages. Wines should also exhibit appropriate flavor characteristics/complexity for its varietal/type. Acescency is the measure of bitterness in a wine and is frequently part of the varietal characteristics of a wine. Regardless of varietal characteristics, a wine should remain balanced and the bitterness, if present should not detract from the wine. Astringency is the measure of tannin in a wine. Tannin is the compound responsible for the dry, puckering sensation one feels after tasting a glass of (red) wine. Because tannin is generally found in higher amounts in young, full-bodied wines and less so in well-aged wines, one must be careful to measure astringency based on the varietal/type and age of a wine. Points for overall quality are the most subjective piece of this scoring model. Generally these points are awarded based on the overall impression that the wine leaves on a taster. The most a wine can score is 20 points, so a �Spectator 100 point wine� would yield 20 points on the UC Davis scale. What I like about this scale is the tightness of the scoring ranges. Now, arguably one could extend the available points for each category to true up the score to equal 100 points, but herein lies the difficulty. There is an elegant simplicity to the UC Davis system that, along with a competently written tasting note, will give the average wine buyer all they need to know to make the right choices. The 20 point scale speaks to critical assessment and not merely rating wars. However, at the end of the day, any numeric scoring system falls short when evaluating an almost purely subjective experience. Download the UC Davis 20 Point System PDF Chart here.